Sometimes the solution is so stupefying simple, it turns us into skeptics. How can it keep escaping our eyes? We are so focused on finding intricacies where none exist that the obvious goes right over our heads. Are we afraid to yield to simplicity and look uneducated or dumb? Or is it that the overly segmented view we have of our world blocks us from grasping the simplicity of the whole? This was the intellectual slap delivered by my teachers as I was learning about the interactions of our bodies with our world, and how understanding them is the key to addressing many seemingly mysterious pains. For us adults, we have come to expect chronic pains as an inevitable part of the aging process (it does not have to be) but when it comes to children, we are puzzled and scratch our heads. Kids should be out playing, not complaining of chronic back, hip, or neck pain. Or should they? Are we forgetting that the interactions that lead adults to chronic pain also affect children? 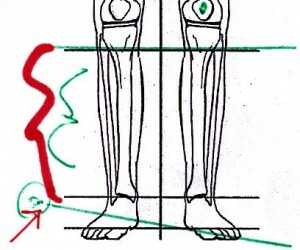 More specific to this topic, we will be covering the role of Leg Length Inequalities (LLI) in structural health. As much as many despise the topic and prefer to bury their heads in the sand, LLIs affect how our bodies adapt to the world (download this free report for more information) and cause a lot more issues than many would care to admit. Gravitational forces discriminate No One. But children have a tremendous advantage over adults when it comes to addressing and overcoming LLIs and they are also more sensitive to its effects. For the past decade, Neurosomatic Educators Inc. in Florida, founders and researchers of Integrative Neurosomatic Therapy (INT) have been documenting the effects of LLIs on children, and more important, the effects of the corrective measures. This is part 1 of 3 of a series in which Paul St. John, Randy Clark, and Kevin Wade share their exciting findings and open a world of possibilities. You may choose to doubt it, contest it, deny it but the evidence is there and is clear. I have seen it myself and I’m currently documenting it in my own practice. Sit back, relax, grab a pen and paper if you want to take notes, and be prepared to see the world with a different set of eyes. I bet your curiosity is at an all-time high, right? Click HERE for Part 2 of this series! There’s a lot more where that came from. I’ll see you on the exercise floor!